Jericho Isn't Cecil's Brother And Is Probably Still Alive, Lion Researcher Says : The Two-Way Citing "huge disgust and sadness," a conservation group said the lion nicknamed Jericho had been killed Saturday. But a researcher in Zimbabwe says he doesn't believe it. 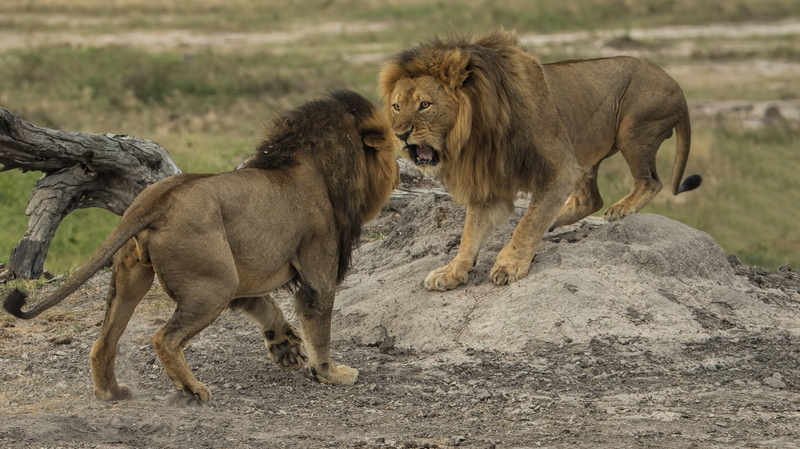 Jericho the lion, right, seen here fighting with Cecil last year, was the subject of competing stories Saturday, as groups in Zimbabwe disagreed over whether he had been killed. Two nonprofit conservation groups in Zimbabwe are telling distinctly different stories about a lion that's seen as an ally of Cecil, the popular 13-year-old animal whose death at the hands of an American hunter in July sparked international outrage. "We are absolutely heart broken," the Zimbabwe Conservation Task Force said Saturday, announcing via Facebook page that Jericho, which it called Cecil's brother, was shot and killed at 4 p.m. (local time) Saturday afternoon. "According to Brent Staplekamp at Hwange Lion Research, Jericho was alive and well at 8.30 tonight and moving around Antoinette Estate ( where Cecil was shot) with a female. I can assure you no one is hunting lion on Antoinette after the Cecil incident!" Perhaps, the trust said, the task force's leaders had confused Jericho with the investigation into another lion that had been shot nearby on July 2. NPR contacted Dr. Andrew J. Loveridge, who helps run the research project in Hwange that's part of the Wildlife Conservation Research Unit in Oxford's Department of Zoology. They're the ones who put tracking collars on both Jericho and Cecil, who was killed by Minnesota dentist Walter Palmer. "We believe this report is incorrect and will confirm with a sighting of the Jericho tomorrow (it is nightime here)," Loveridge says. As for the relationship between the two lions, Loveridge says, "Cecil and Jericho are not brothers, but male lions frequently form coalitions with unrelated males in order to successfully hold territories." Jericho had been mentioned in an update by the WCRU unit earlier Saturday, in which Dr. David Macdonald wrote that Jericho, who had previously been mentioned as a potential threat to Cecil's cubs, was in fact helping to protect them. "Cecil's coalition involved a partnership with another beautiful male, nicknamed Jericho," Macdonald wrote. "Jericho is as likely as Cecil to be the father of some of the cubs, so he has a stake in their survival. Right now, Jericho is in good health and he (and the lionesses) will defend the cubs." Agencies in both the U.S. and Zimbabwean governments are looking into Cecil's killing, which reportedly took place after he was lured away from western Zimbabwe's Hwange National Park.